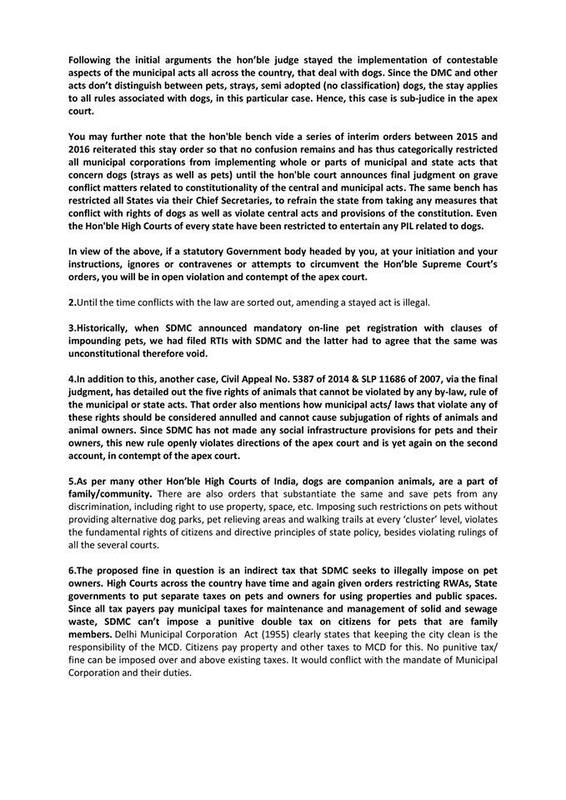 Below is the copy of the Legal Notice sent by a Delhi based Animal Welfare Activist Rishi Dev to the Concerned Office Bearers in the SDMC i.e. South Delhi Municipal Corporation. 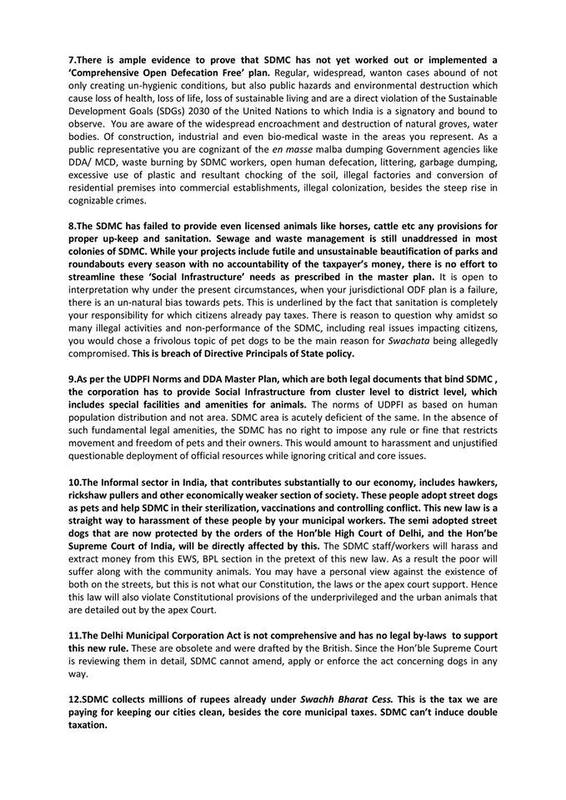 It is to be noted that SDMC had advertised with a lot of media coverage their ‘intent’ to levy a fine of Rs.500 and ‘haul up’ every pet owner any time that they err and do not pick up the poop off their pet dog. While we at JAAGRUTI strongly endorse ‘responsible pet ownership’ and do encourage pet owners to pick the poop up after their dog has done it and help keep the surroundings clean and do it ourselves as well, what these SDMC these office bearers should understand that in a country in-famous for open defecation, is that such a one-sided dictat has to be thought through before being ‘imposed’ lest it gets misused by the Municipality staff and RWA (Resident Welfare Association) office bearers to ‘harass’ pet owners and many street dog caretakers. In any case, with pet abandonment on a rise in big cities, such ill-thought out words coming out someone in as responsible a public position like a Mayor of the Corporation, will only instigate more people to abandon their pets. 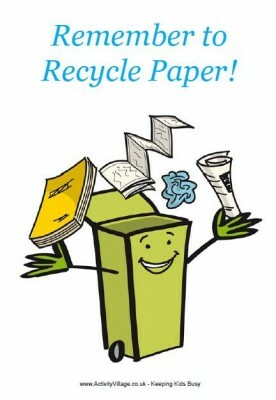 Instead through awareness messages, SDMC should encourage environment-friendly messages on the relevance of picking up a pet dog’s poop, not using polythene bags, planting trees, relevance of Street Dog Animal Birth Control and Anti-Rabies Vaccination drives etc. What we as a Country and as Indians need is some sensitivity and compassion and Empathy drilled into our minds to encourage responsible citizenship rather than ill-thought of dictats that only offend some and appease some. 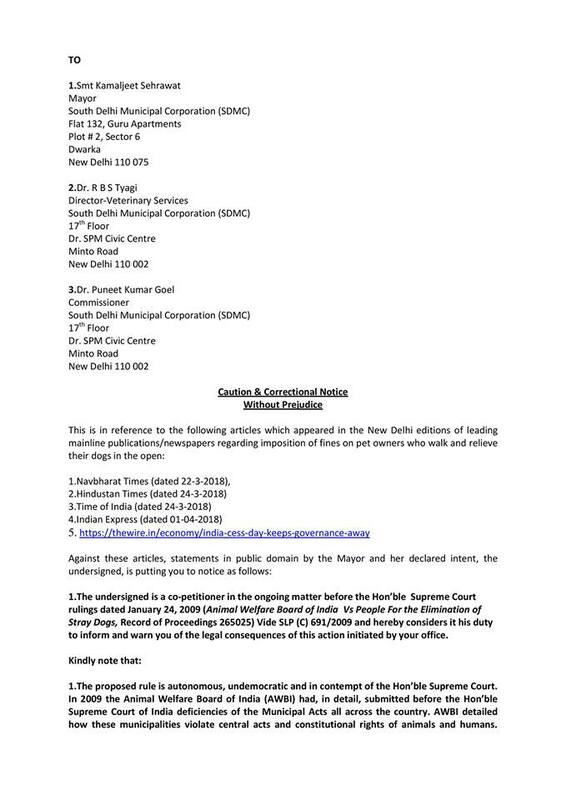 TAKE ACTION: South Delhi people can still keep writing letters to the SDMC Mayor whose address is in the Notice-remember to send your letters registered Via India Post. Keep the Receipt of the Post safe with you. 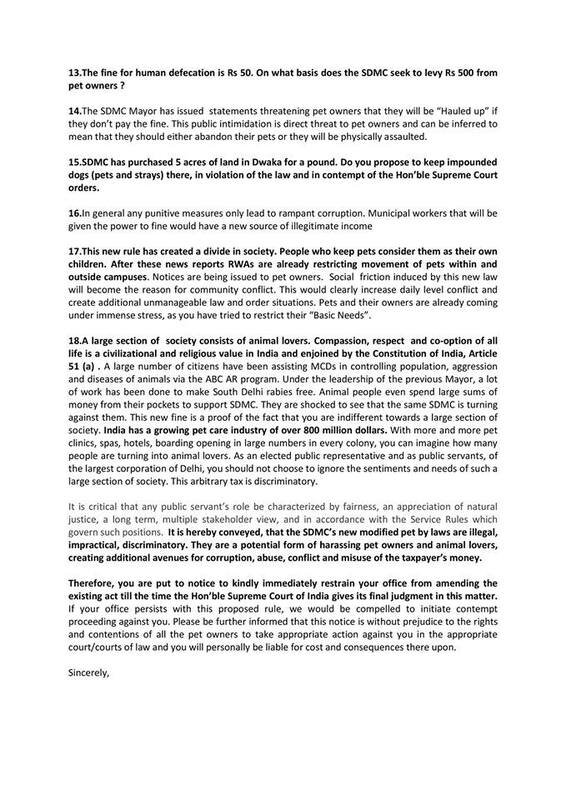 It is a very self-explanatory notice that touches upon a lot of issues and thus it is important every street dog caretaker as well as Pet owner reads it. It’s basic civic sense….Which we Indians clearly lack and instead of getting animal poop of the streets you are justifying it by saying this country is used to open defeacation. This country will always be dirty and hence disease ridden because of people like you who fight for causes like this. We as Indians do everything our way till a fine is levied. So why make an issue of it. See its an outrageously hefty fine and if it has to be levied, it also should be levied on humans who are openly defecating as there numbers are 10000s time more. Now if you were to counter it saying there are *not enough toilets for humans or not enough public parks*, then the same argument is what pet owners are using that there are no places earmarked for them walking their pets exclusively. We personally use a pet scooper and encourage pet owners to do so as well as part of their respinsibility and we have written that above as well. But SDMC’s intent to intimidate pet owners is uncalled for and lawfully unjustified.